Follow Glenn Wakefield on his second attempt at a single-handed, non-stop west about circumnavigation from Victoria, British Columbia, Canada. Departure date ( early fall, 2013) to be announced soon. Visit kimchowaroundtheworld.com to find out more about Glenn’s first attempt in 2007-2008. At 2 p.m. on September 23, 2007, Glenn Wakefield set out to fulfill a dream he’d imagined most of his life. 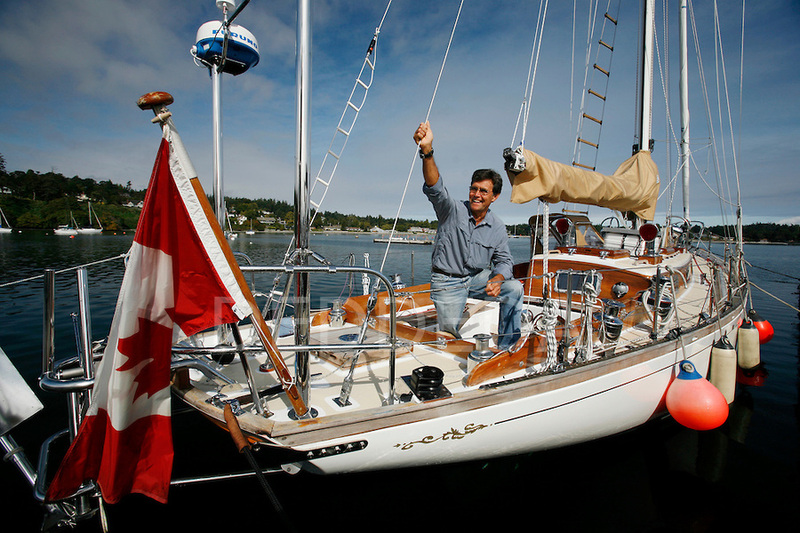 For five years he undertook a major restoration of his Phil Rhodes Offshore 41′ sloop Kim Chow, in preparation for his single-handed, non-stop west about circumnavigation from Victoria, B.C. Canada. With his family and friends by his side, and a group of curious onlookers who’d gathered on the wharf to wish him well, he set out. To his surprise, hundreds showed up that day to wish him fair winds and a safe return. They’d read an article in the Globe and Mail, heard him on a local radio station or saw him on television. Over the course of his circumnavigation, curious onlookers turned into interested supporters and fans who visited the blog kimchowaroundtheworld.com. The blog attracted thousands of followers from more than 100 countries who wanted to connect with Glenn and be part of the conversation. In turn, their interest and enthusiasm inspired Glenn to push on. On April 24, 2008, after 220 days alone at sea, Glenn was forced to abandon his disabled vessel about 1000 miles off the coast of Argentina in the Southern Ocean. A series of relentless storms rolled his boat causing him injury and serious damage to the boat. Thanks to the extraordinary bravery of the Argentinian sailors aboard the SV Puerto Deseado, Glenn was rescued and brought safely to shore near Ushuaia, Argentina. Distance to Falklands waypoint: 310 nmi. 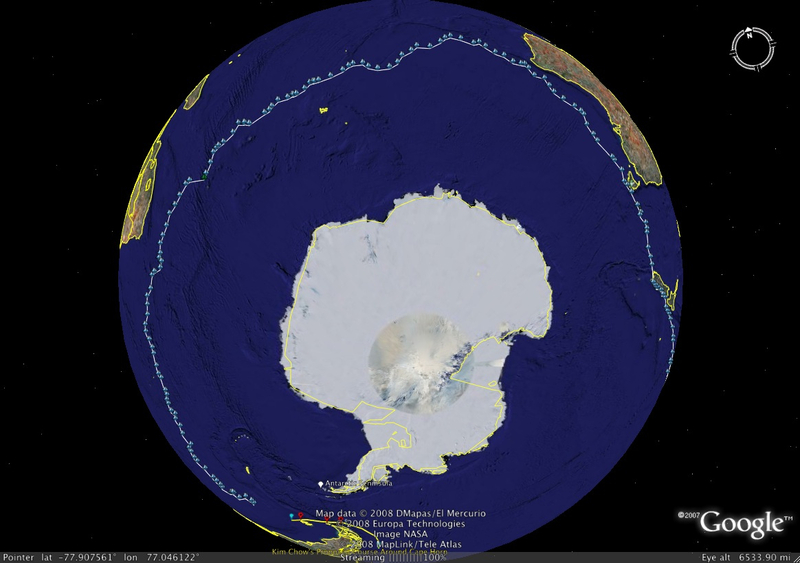 Distance to Cape Horn: 710 (est.) nmi. 50 knots with 6 metre swells from the SW. Barometer is 981. Temperature is 9 C with 100% cloud cover. Conditions have worsened since yesterday. Glenn reports Kim Chow has rolled over and both he and the boat have had some damage. Glenn has suffered a blow to the head and has had a concussion and scratch to his scalp. Kim Chow has lost her life raft, both solar panels, the dodger and one hatch. She has some damage to her steering and a port light. The mast is still up and in tact and the boat is water tight. Glenn is now dealing with the aftermath of the roll over – sorting out the confused mess down below and reports conditions are very wet down below. Extreme weather conditions are expected to last for the next several days. Glenn is going to sit it out and then continue to head to Port Stanley in the Falklands. He has been in communication with the Royal Navy in the Falklands who have offered their assistance as well as the Navy in Argentina who have also offered to provide a replacement life raft. Glenn reports that he will be fine, and he is confident he can make it through this and on to Stanley on his own, without assistance. He is very grateful for the moral support from the Navy in both countries and fellow sailors in the area who are in regular communication by ham radio. Listen to Glenn’s audio message over his ham radio from Kim Chow. He’ll follow a classic west about route starting from his home port of Victoria, British Columbia, Canada. He’ll sail out the Straits of Juan de Fuca and southwest for 200 miles to avoid coastal shipping traffic, and then head south. He’ll cross the Inter Tropical Zone (ITZ) at approximately 135 degrees longitude, then southwest across the South Pacific Ocean to the southern tip of New Zealand. He’ll round the first of the five great capes – the South Cape off Stewart Island – south of New Zealand, across the Tasman Sea and around the second cape -the South Cape of Tasmania, then across the Australian Bight past Cape Leeuwin – the third cape. 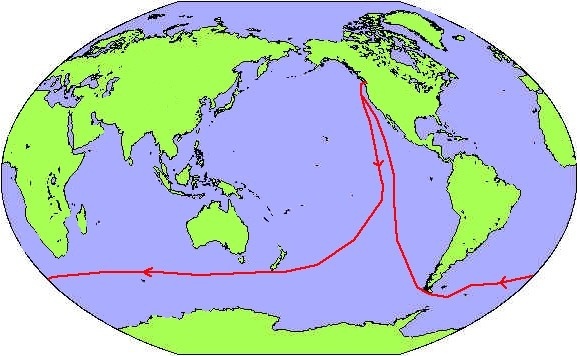 From there, he’ll sail across the South Indian Ocean below the Cape of Good Hope, and finally across the South Atlantic Ocean to Cape Horn – the fifth of the great capes. Once around Cape Horn, he’ll head out to 80 degrees west before heading north across the equator to Cape Flattery and the entrance to the Straits of Juan de Fuca and home to Victoria. This is a circumnavigation of approximately 30,000 nautical miles that he expects to complete in approximately 10-12 months.